FHA states that 3.5% of the purchase price must be paid as down payment at time of purchase. The money for the down payment may come from the borrower’s funds such as checking, savings, or money market accounts. It may also come from retirement accounts or stock and bond investments. FHA will also allow family members to gift the money to the buyers for the down payment. Certain documents are required in order to show the transfer from the relative to the buyer. 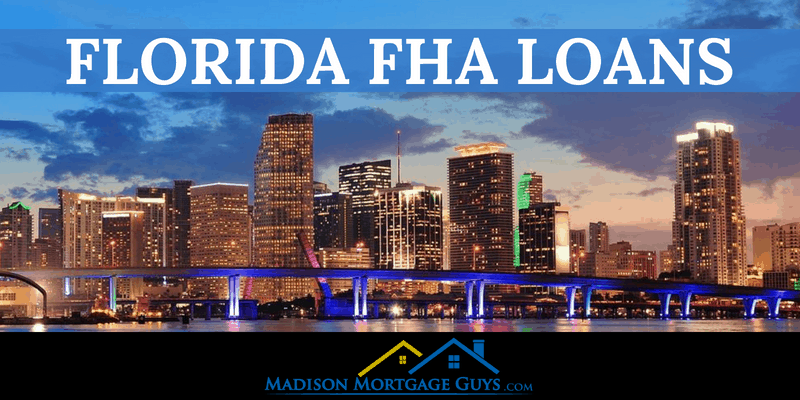 The Florida FHA loan has maximums in place. The maximums are dependent on the type of property and the county where the home is located. For example, in Alachua county, the maximum amount for a single family home is $314,827 and for a four-plex the maximum is $605,525. However, in Collier county, the maximum for a single family home is $450,800 and the maximum is $866,950 for a four-plex. Obviously, it makes sense to check with your lender to find out the maximums in your county for your intended property type. View current FHA loan limits. This is one of the major benefits of an FHA loan. FHA will allow sellers to pay up to 6% of the selling price towards the closing costs. This is not a requirement of the loan, but merely it is allowed by FHA. The buyer and seller, along with the real estate agents, will need to negotiate this in to the contract. In order to determine if a borrower is eligible for an FHA loan, lenders will examine the borrower’s debt and income and calculate a ratio. The debt-to-income ratio has two formulas. The first formula takes all of the borrower’s monthly debt payments and compares it to their monthly gross income. It is often called the front end ratio. Generally speaking, the ratio should be around 28%, but there are many borrowers who get approved for loans with a higher ratio. The second formula takes the borrower’s monthly debt payments and adds it to the proposed mortgage payment and then compares it to the monthly gross income of the borrower. This calculation is often called the back-end ratio. Again, in general, the back end ratio should be approximately 41%, but it is common for borrowers to be approved with higher ratios. For an example, suppose a married couple has a yearly gross income of $84,000. This means that their monthly income is $7,000. If the couple has monthly debt payments of $1,610 this would mean the calculation would be $1,610 divided by $7,000 is 23%, which is acceptable. Furthermore, if the proposed home payment is $1100, the calculation would look like this. This debt to income ratio would also be acceptable. Many online lenders and nationally televised commercials boast about approving low credit scores for FHA loans. However, this information can be slightly misleading. It is true that FHA approves borrowers with less than perfect credit scores on a regular basis. It is also true that getting approved for an FHA loan is much easier compared to other kinds of loans. However, many lenders have their own credit overlays. Since each borrower’s situation is unique, it is impossible to apply a blank statement to any credit range or credit score. It is much better to talk to an experienced FHA lender and get pre-approved for a home loan. Borrowers will need to prove their income for the last 2 years. People that are employed will need to offer copies of W-2 statements, pay stubs and tax returns. People that own their own business, or partial owner of a business, will need to provide copies of personal tax returns along with business tax returns. People with other forms of income, such as retirement earnings, disability income, or investment income will likely need to show monthly/quarterly statements along with personal tax returns. FHA will allow people to buy single family homes as well as multiple unit homes, up to 4 unit properties. Condos are also allowed if the condo project is approved for FHA financing. FHA does not allow loans on investment homes or vacation properties. The borrower must intend to live in the property as their main residence. FHA will allow people with previous credit issues to purchase a home, depending on certain rules. Here are some of the common issues and their rules. People that have filed chapter 7 bankruptcy must wait 2 years after the discharge before applying for an FHA loan. If there are extenuating circumstances that caused the borrower to file chapter 7, they may be approved for a loan prior to the 2 year waiting period. For chapter 13 filers, the borrower may be eligible for FHA loan by using the chapter 13 payment history if the bankruptcy is discharged. Borrowers that are delinquent on child support will need to get their payments up to date before applying for FHA financing. Any borrower that is behind on paying federal taxes is not eligible for an FHA loan. The borrower will either need to pay off the tax debt or arrange payments and develop a payment history before applying for FHA. Borrowers that have student debt in deferment will need to allow for their loans in their debt-to-income calculations. 1% of the total balance will be calculated as a monthly payment that is included in the debt to income ratios. FHA offers a unique product to help people make improvements and/or repairs to their home. his loan is called the FHA 203k loan and can be used in several ways. FHA will allow people to borrow enough money to buy a home and get extra funds to make minor repairs or home improvements. This is called the FHA 203k Streamline loan. The maximum amount of funds that can be used for the repair work is $35,000. FHA puts a few limitations on how the money can be spent with the streamline option. Basically, the money is intended for minor repairs or slight improvements. The other type of FHA 203k loan is called the standard version. It has very few limits on how the money can be spent. The amount of money that can be loaned is based on the maximum loan amount for the county and the customer’s debt to income ratios. This program will allow customers to totally renovate the home. For the standard version, a certified home contractor must be used and certain lending rules will need to be followed. FHA offers a variety of ways to refinance a loan. Customers may choose a cash out refinance or a streamline refinance option. The streamline refinance is only available to people that currently have an FHA loan. For qualifying borrowers, this can be a great way to lower their interest rate without a complete loan process. People may choose to refinance their home loan in order to tap in to the property’s equity and use the excess funds to pay other bills, go on vacation, pay off a car, or other reasons. It is not a requirement to currently have an FHA loan in order to apply for an FHA cash out loan. People with a VA loan, conventional loan, USDA loan, FHA loan or other type of mortgage may apply for the cash out finance. The requirements for the refinance are basically the same as for an FHA purchase loan. There are lots of reasons for people to apply for the Florida FHA loan. Whether it is buying a home, refinancing an existing mortgage, or buying a fixer upper to make improvements and live in the home, there are numerous ways to use the FHA program. The various uses of the loan make this an appealing option to numerous buyers and make it possible to become a homeowner with relative ease.